Your easiest way would be to take the MRT because Chinese Gardens is just two stops away. 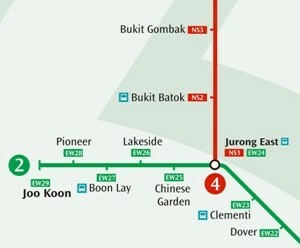 First take the North-South 'Red' Line from Bukit Batok to Jurong East interchange, and then change over to the East-West 'Green' Line going towards Joo Koon. Chinese Gardens is the next stop after Jurong East, and there's a path leading from the Chinese Gardens MRT station to the actual gardens. The train station, depending on which part of Bukit Batok you're living, is quite a distance. Bukit Batok is this general area that includes Bukit Gombak as well. Usually, we locals refer to the area around Bukit Gombak MRT Station, Little Guilin and near the Bukit Batok Driving Centre (BBDC in local acronym terms) as Bukit Gombak instead of Bukit Batok. Or for general reference, any road names beginning with Bukit Batok West is generally located within the Bukit Gombak vincinity. Most of the trunk services (bus services that operate from one terminal to the next) run through Bukit Batok West Avenue 3 and Bukit Batok East Avenue 3 (yes, our naming of roads are not very distinctive). It is the length of road that runs from Bukit Batok Road where there is a Shell Station at the traffic junction, all the way pass Bukit Batok Central (and the Bukit Batok MRT Station) and ends at the Pan-Island Express (which we locals call by its acronym, PIE). Along this road, you may catch bus service 157. The bus will bring you to Jurong West, where you are to alight and walk a distance to Chinese Garden. It would be easier to take the train, but I have to say that if it's your first time in Singapore you will be able to find coffee shops around the Jurong West area where you can grab a bite after your visit to Chinese Garden. Not the answer you're looking for? Browse other questions tagged public-transport singapore or ask your own question. What are the options for a prepaid SIM card in Singapore? Where could I stay for a single night stopover in Singapore to visit the botanical gardens?